Charlie was called as Worship Pastor of NorthPark in June of 2000 and served until August of 2006. He was blessed to return, almost 7 years to the day, in August of 2013. Originally from the great state of Mississippi, he has been in Alabama since 1993 and is a University of Alabama football fanatic (sorry Auburn friends). Charlie holds a Bachelor of Music degree in Vocal Performance from Mississippi College in 1982 (Go Choctaws). He attended New Orleans Baptist Theological Seminary where he attained a Masters of Music in Vocal Performance in 1991. 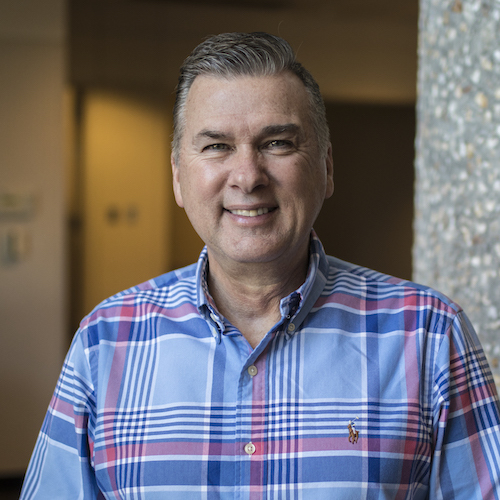 He decided he liked school so much, he went back and acquired his Doctorate of Education Ministries degree with an emphasis in Worship Studies in 2017. Charlie has been married to his high school sweetheart, Lisa, since 1982. They have three wonderful children; one wonderful son-in- law; one soon-to- be wonderful daughter- in-law, and the sweetest grandbaby in the world, “Bo”, who was born in October 2017. Charlie and Lisa are now known as “Lolly” and “Poppy.” When Charlie isn’t serving at NorthPark, he loves to read and do yard work at his home in Trussville. He also likes to hunt and fish when he has time (in other words…never). He is very passionate about leading worship and loves to equip and train worship leaders.